I downloaded the binder cover from this site and then edited the words. So far, I have a grade level section in which I have Bible verses and poetry divided by grade -with 1 item per month. Often the verses or poems correspond to the seasons or relevant holidays. But this has not been enough for my kids so we’re going to add in more memory work in more subject areas. And many more things as we come across them in our studies. I’ve organized all the pages in one binder with different tabs. I page protected each page since we review our work during meals. We plan to review the grade level work each day and then do review in one of the other subjects each day so that by the end of the week we’ve reviewed work in each section. To keep track of each child’s progress in each subject I use color-coded sticky notes to flag their place. 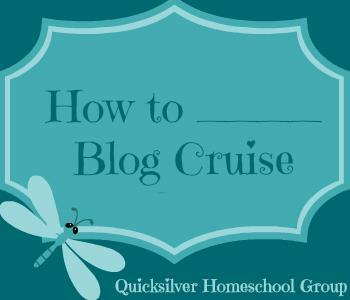 Linked with the How To Blog Cruise from the Quicksilver Group! This is such a great idea! I have been wanting to organize our memory work for a long time. Thanks for the ideas. I love this! Thanks for writing about it. I have been looking for ideas like this just didn't know where to start. Can't wait to get started on ours. Thanks so much for sharing this. It's pretty and it's efficient! What a great idea – thanks for sharing it! It's simple and very easy to use. Plus, it's easy to clean with the page protectors! I love that we do ours during meal time. The kids complain less about doing memory work as we take turns doing it around the table. I think the mealtime idea is a great idea. We only do AWANA memory work but I have one son who complains about it like crazy. If we were all saying verses around the table I bet he would be more consistent about it. Lexi this is a great idea! I am going to check out the links you suggested. We have found that breakfast time is the perfect time to do our memory work. We are always eating breakfast together so it helps us stay consistent. And it makes it less boring if the kids can take turns between bites. I enjoyed this and have linked to this post on my blog. We have been learning a verse from the Bible each week or fortnight but need to increase our memory work.